Raising children, parenting, is very rewarding, but it can also be challenging. Children test parents frequently. They test the boundaries of their freedom and the depth of parental love. These challenges require that the parents be able to deal with stress, to regulate their own emotions, and to be sensitive and attentive their child. These skills are exactly those that are developed in mindfulness training. It improves the psychological and physiological responses to stress. It improves emotion regulation. It improves the ability to maintain attention and focus in the face of high levels of distraction. Mindful parenting involves the parents having emotional awareness of themselves and compassion for the child and having the skills to pay full attention to the child in the present moment, to accept parenting non-judgmentally and be emotionally non-reactive to the child. Obesity has become an epidemic in the industrialized world. In the U.S. the incidence of obesity, defined as a Body Mass Index (BMI) of 30 or above has more than doubled over the last 35 years to currently around 35% of the population, while two thirds of the population are considered overweight or obese (BMI > 25). Sadly, children and adolescents have not been spared with 1 in 5 school age children and young people (6 to 19 years) classified as obese. This can be particularly troubling to adolescents who are very sensitive regarding their bodies and appearance and can be the victim of ridicule or shaming by peers. One helpful method to reduce intake and help to control body weight is mindful eating. It involves paying attention to eating while it is occurring, including attention to the sight, smell, flavors, and textures of food, to the process of chewing and may help reduce intake. Indeed, high levels of mindfulness are associated with lower levels of obesity and mindfulness training has been shown to reduce binge eating, emotional eating, and external eating. In addition, mindfulness has been shown to improve the individual’s ability to respond adaptively to emotions. Hence, mindfulness may be an antidote to emotional eating. It is not known if mindful parenting can reduce emotional eating in adolescents. In today’s Research News article “Is Mindful Parenting Associated With Adolescents’ Emotional Eating? 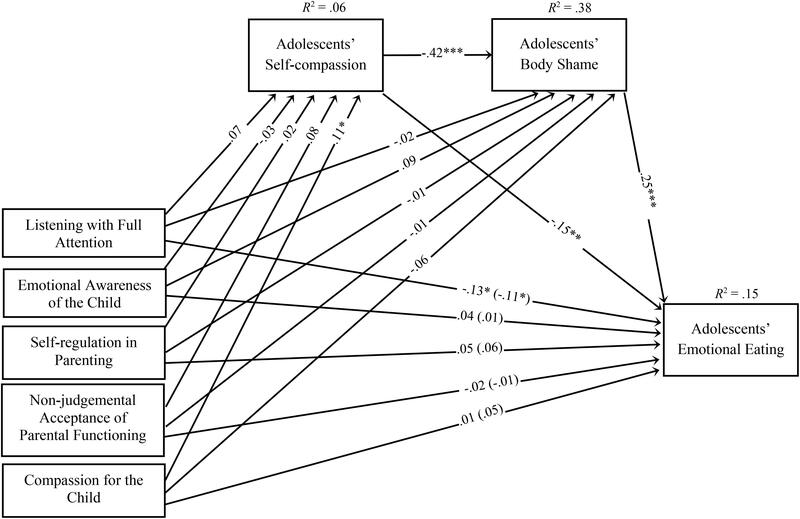 The Mediating Role of Adolescents’ Self-Compassion and Body Shame.” (See summary below or view the full text of the study at: https://www.frontiersin.org/articles/10.3389/fpsyg.2018.02004/full?utm_source=F-AAE&utm_medium=EMLF&utm_campaign=MRK_812127_69_Psycho_20181030_arts_A ), Gouveia and colleagues recruited parent-adolescent dyads of mother or father and their 12-18 year old adolescent. The parents were measured for body size and mindful parenting. The adolescents were measured for body size, self-compassion, body shame, and emotional eating. The dyads were separated based upon the Body Mass Index (BMI) of the adolescents into normal weight and overweight and obese (BMI > 85th percentile) groups. They then performed a regression analysis of the data. They found that the best fitting model of the data indicated that mindful parenting of the adolescents by the parents was associated indirectly with reduced emotional eating by the adolescents. The indirect path indicated that mindful parenting was associated with increased adolescent self-compassion which was in turn associated both with reduced emotional eating and reduced feelings of shame concerning their bodies which in turn was associated with reduced emotional eating. They also found that the facet of mindful parenting that was most associated with the benefits was the parents’ compassion for the child. These results are correlational, so no conclusions regarding causation can be inferred. The results, however, are suggestive that the parents’ compassion for the child affects the child’s feelings of compassion toward itself which helps the child overcome feeling of shame about its body, all of which contribute to reduced eating in response to emotions. 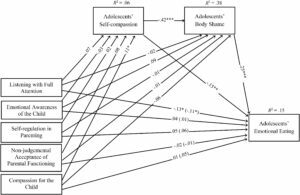 It remains for future research to determine if promoting parental compassion toward the adolescent may cause positive change in the adolescent, improving self-compassion, reducing body shame, and in turn reducing emotional eating. So, improve adolescent’s self-compassion and reduce emotional eating with mindful parenting.